In some Occasions, Offline Storage of the Websites is quite handy to get the information. You can use that offline pages, whenyou are travelling, have no Wi-Fi Access and disconnected from Internet. In the Internet world, We all are always connected to the web, It may be a home, workplace or even in the street side. The best way to deal with this problem, you can keep offline storage of your Favorite content to read when you are not connected to Internet. WebCopy is the Free Windows Tool that allows you to save the entire websites or portion of it to your local disk. Also, It has the some cool customization features. Using that You can save the web pages for better offline Reading. Download and Install the WebCopy in your computer and Launch it. The User Interface of the WebCopy is very simple, and you can access all the menus in the menubar. There is two address bar in the Window, First one is to enter the website you want to download, the second one is location where you want to store in your computer. Go to Tools > Options to access the default preferences of WebCopy. There you can set default download location, change the appearance, notification. The appearance tab has the options to customize , how the downloaded websites will look a like. The Notification will alert you when the website downloaded for offline access completely. To save the website for Offline Access, Enter the particular URL in the Address bar, Click ‘Copy Website’. The WebCopy will start the process and download the website in your local folder. It will ask the permission to create folder to save the website. Next, You will alert when the a WebCopy has finished the Downloading. You can also get the download errors in that window. Click the Save button to save the current website as a WebCopy project for later access. That is, if you want to save any other web page from the same website, you can open the WenCopy project file for that website. The RulesEditor allows you to configure how the web site is downloaded. 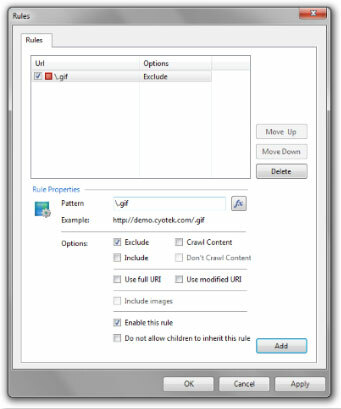 To open Rule Window, Go Project > Rules or Click CTRL + R.
For example, In the Pattern field, enter .gif and add the rule for the current website to exclude the particular file type from downloading.